This week I accomplished a major milestone. The Ebihen was turned over for hull planking. To get to this point of construction I have been building for four months. 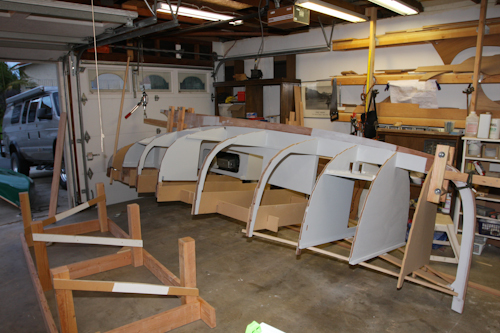 I am amazed that it is looking so good based on my unknown boatbuilding abilities. Taking my time on each phase of construction, spending an equal amount of time in planning as in construction appears to have been a good plan. Turning the boat over has been a long term thought process for me. I wondered how I was going to do it. My priority was to figure out a way that I could do it myself. I had a number of volunteers who would help me, but I wanted the challenge at this stage; and I might need them latter for the next turn over after hull construction. After reviewing a number of U-Tube videos and chat room conversations on boat turning, I decided to make extensions to the boat that would allow me to balance the boat and spin it on it’s axis. 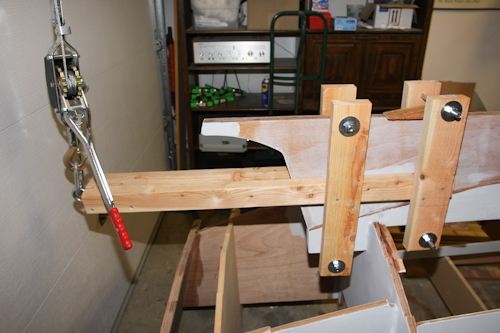 I did not want to screw anything into the boat that would need removing and patching, so I designed a clamp system using standard two by fours and 10 inch bolts. The boat flipped easily and I was able to control the rate of turn over. I had purchased two hoists but one was defective so I used a rope on the bow after hoisting to the approximate height. This was a bit of a problem because I did not raise the bow enough to clear the ground after turning. I was able to simply lift the bow to the center point,but in hindsight I would have one hoist each for bow and stern that I could adjust as necessary. Here are all the photo’s from the day. Hoist point in rafter, backed up with 2×4 across joists. Large drill bits needed for boring bolt holes in clamps. The construction frame being shortened to new length. Aft Pivot, be sure to extend out past top of stern. Tied additional rope as insurance from slippage. 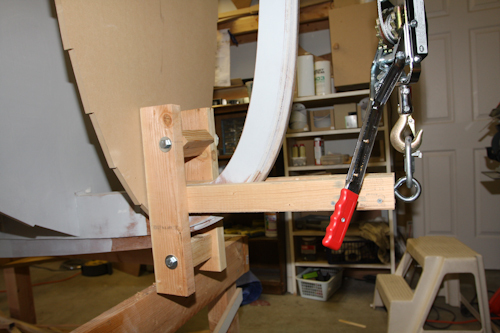 Another view of stern clamp with hoist attached. And finally, with the garage cleaned up and the Ebihen resting on its new shorter and lower construction frame. My next agenda items will be to complete the sealing of floorboards and the purchase of plywood for the hull strakes (planks). 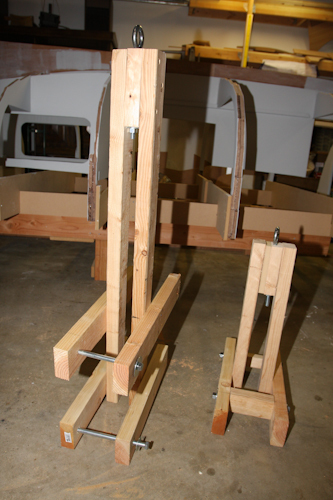 Ebihen now ready for planking on the shorter and lowered construction frame. This is all pretty amazing! I hadn’t checked your site for awhile. You make it all look very easy, but I’m sure it’s not. This may sound like a stupid question, but could you have built it upside down on a lower frame from the beginning? The Christmas Wherry that I have plans for is constructed that way. Of course all the interior finishing would come later. I followed the construction plans from the designer. 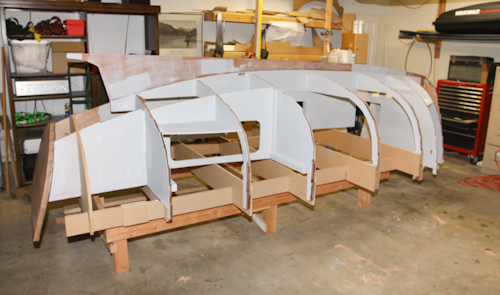 “Due to the strong thickness of the backbone and transverse bulkheads, it is possible to assemble the boat structure in an upright position, without any strongback. 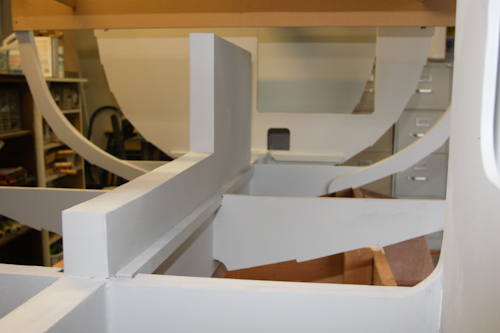 This method saves material and working time” It was easier to assemble right side up with this design. I also had the benefit of finishing off the interior prior to planking. This was very comfortable as I could stand normally for all access points. Now that the boat has been turned over for planking, I do not have much access to the interior portion. I believe each boat design has it’s own recommended method of construction. 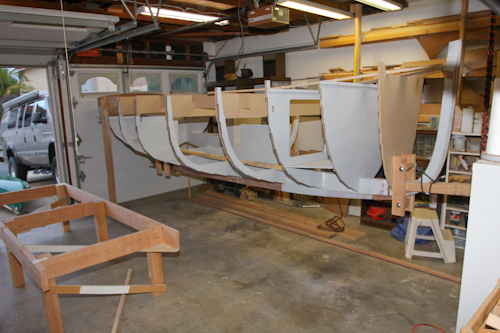 The majority of small boats are constructed upside down until the hull is finished and then flipped for the interior construction. WOW! It looks so different painted. Measure twice, cut once is a good rule for all things in life.